The Canon PowerShot SX270 HS is essentially the same as the flagship SX280 HS model, but without that camera's GPS and wi-fi functionality. That's a shame, especially as there's only a small difference in the price of the two cameras, but overall the Canon PowerShot SX270 HS is a well-specified travel-zoom that offers the joint-best image quality in its class. Image quality is slightly better than on the previous SX260, which was already very good, thanks to the debut of the DIGIC 6 processor. The back-illuminated sensor helps the SX270 to perform well in low light, with a usable ISO range of 100-1600 and even the higher settings proving adequate for web use and smaller prints, although we'd avoid the new top speed of ISO 6400. Full manual controls make the SX270 HS as well suited to more experienced users looking for a compact alternative to their DSLR as it is the beginner, but disappointingly there's still no raw format support. The same 25-500mm, 20x zoom lens offers a broad focal range that makes it possible to frame up subjects near or far in pretty much an instant, pretty amazing given the size of the SX270 HS which is only a little larger than most compacts. 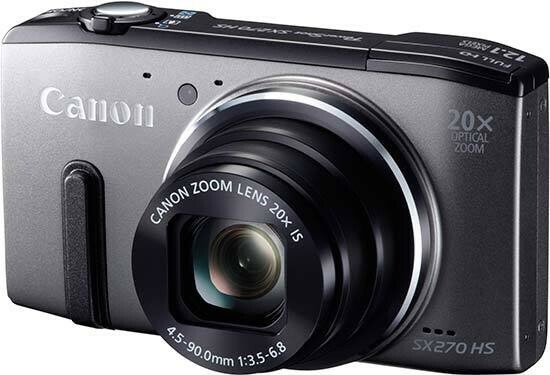 Only available in the UK, buying the Canon PowerShot SX270 HS only saves you £20, which we think would be better spent on the GPS and wi-fi connectivity of the SX280 HS model.